when they were named the 2015 Teachers of the Year. 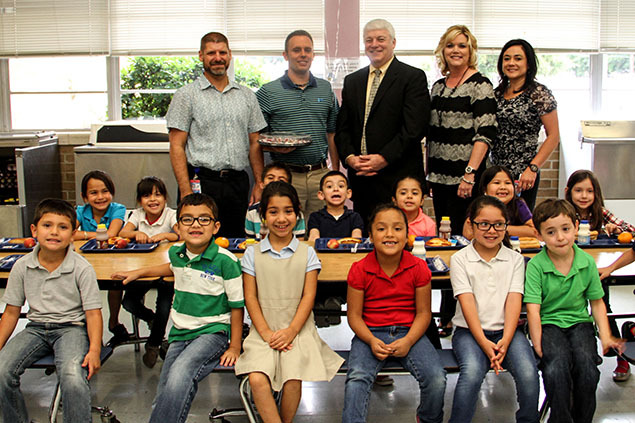 Superintendent of Schools Dr. Kirk Lewis delivered the news by surprising both teachers in their classrooms. Mooneyham was named the winner of the District Secondary Teacher of the Year award. Mooneyham is molding today’s students into tomorrow’s leaders. As Lieutenant Colonel of the Rayburn JROTC program, students become well-rounded individuals who dedicate countless hours through community service efforts to serve the citizens of Pasadena. His leadership has marched students to victory in numerous competitions both at a regional and national level. In fact, students recently participated in the U.S. Army National JROTC Drill Team Championship. Competing against 80 teams throughout the U.S., the Texan Brigade Unarmed Drill Team and Color Guard placed second in Inspection, third in Exhibition and fourth overall in the nation. Mooneyham teaches more than the JROTC curriculum – he inspires students to achieve success in life. Watson was named the winner of the District Elementary Teacher of the Year award. Watson wears many hats at his campus, but the one he never takes off is that of a caring individual. As a kindergarten teacher, students in Watson’s class are given the freedom to explore, take risks and learn independently. Pushing students to their highest potential, they each read one book a day. By the end of the school year, reading becomes part of their daily regimen. Watson is also a team leader. His progressive teaching style guides his team in planning engaging lessons for students that move learning forward. He is student-focused and helps them make decisions in the best interest of students. Watson’s love of learning helps mold students into eager learners. Dr. Kirk Lewis, Superintendent of Schools; Alan Mooneyham, Secondary Teacher of the Year; Robert Stock, Sam Rayburn High School Principal; Dr. Rhonda Parmer, Associate Superintendent of Campus Development; and Dr. DeeAnn Powell, Deputy Superintendent of Campus Development. Michael Hanson, Principal; Jason Watson, Elementary Teacher of the Year; Dr. Kirk Lewis, Superintendent of Schools; Dr. DeeAnn Powell, Deputy Superintendent of Campus Development; and Alyta Harrell, Associate Superintendent of Campus Development.